We have the best auto repair manuals to help you maintain, service and repair your precious automobile. Whether it's a Haynes repair manual for the Ford Mustang 2005 through 2014 or a Bentley repair manual for Toyota Corolla 1975-1979, we have it here. 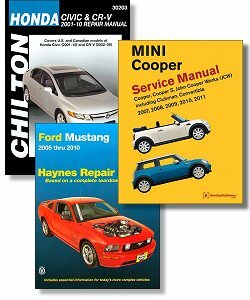 The Motor Bookstore carries the full line of Chilton car manuals, Haynes auto manuals and Bentley DIY workshop manuals so you will surely find exactly what you need with us. Having access to authoritative automotive repair books provides the power to maximize your vehicle investment and keep your beloved ride on the road and running in peak condition. Why waste time and money on auto manuals and online how-to videos that leave you more confused about what you�re doing than before you started? Our Haynes service manuals, Chilton books and other DIY car repair manuals provide the detailed procedures and accurate diagrams and specifications you need to confidently tackle anything from basic maintenance services to critical engine repairs. We also offer a comprehensive selection of factory passenger car shop manuals, also referred to as Original Equipment Manufacturer, or O.E.M. for short. These car shop manuals are in-depth vehicle repair guides which cover domestic cars ranging from the early teens to the late 1970s.You�ll always find an array of DIY manuals and car repair books in stock at the best prices to help save you money completing your own auto services. In addition to printed OEM guides, we also stock a large selection of factory manuals on CD. They're mostly for domestic makes and models, with some import coverage. If you�re searching for a specific auto repair book on CD, get in touch with us for assistance finding what you need. We don�t just sell the most detailed and easy to follow OEM, Haynes and Chilton auto repair and service manuals for novice mechanics. We also offer Autodata Professional Manuals for professionals (or knowledgeable do-it-yourselfers) looking for a comprehensive resource that can be called upon again and again. If you're a mechanic working on various models of cars, repair manuals that you can count on are essential shop supplies. With the Help of the Right Auto Repair Book, You can fix it! The DIY manuals that we sell can help you save money on all kinds of service, repair jobs and more on your automobile. Easy-to-follow step-by-step instructions with clear and close-up photos ensure you have the right level of information to do the car service or repair job right. From Chilton repair manuals to Haynes books for cars, you can be sure you�re getting a quality piece of literature capable of answering all our questions. Having access to an automotive repair manual is like having a professional car mechanic by your side. And equally as important, you must have the right car service manual. One that will provide step-by-step, easy-to-follow instructions to help you get the job done quickly and correctly. The car repair manuals available at The Motor Bookstore provide exactly that. Clear, sequential text instructions, accompanied by sharp photos and illustrations of a complete vehicle tear down and rebuild. And best of all, whether you choose a Haynes, Chilton or Bentley repair manual, they are intended for the do-it-yourselfer, so you can repair or maintain your car with ease. From the simplest service procedure to the most complex overhaul job, an automotive repair manual can quickly become the most essential item in your toolbox. Whether you need Haynes auto repair books, a Chilton car manual or a factory shop service manual, we�ll help you find exactly what you require. Give us a call, send us an email or contact us online for assistance.